We’re in Spain in the age of austerity – 2013, to be precise – and Sofia is one of the lucky ones: she has a job. Increasingly, however, working as PA to one of the country’s richest bankers is causing friction with her family. As Sofia is no more talented, intelligent or industrious than her unemployed friends, her mother wonders, what could be the real reason that Sofia was successful where so many others have failed? Might she have given more than just the right answers in the interview? It is through the prism of this prickly mother-daughter relationship that Alexandra Wood explores the impact of the global financial crisis on families and communities; how the growing chasm between the haves and have-nots might distort value systems on both sides. While mother Patricia needles away at Sofia about the nature of her relationship with boss Antonio – whose place at the top of the capitalist machine proves that he is ‘rapacious, corrupt, corrupting’, a manipulator of markets and people – Sofia finds herself forced to defend her employer, mainly through reference to his philanthropic activities and charitable donations. As mother and daughter thrust and parry their way through the debate, with Patricia increasingly resorting to emotional blackmail to get her way, it becomes clear that the truly ruthless manipulator might be much closer to home. 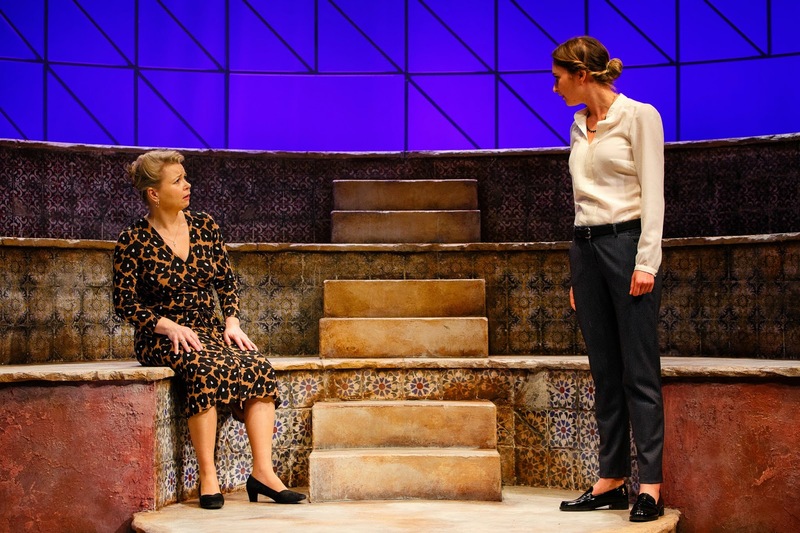 Matthew Wright’s set design, with its mix of tiled stone steps and the suggestion of modernist glass and steel, conveys the clash of old and new Spain, of traditional family values against pernicious individualism. The stepped layout allows for director Jennie Darnell to be explicit about the power dynamics of each exchange, a little clunkily at times, but the curved Perspex at the top of the set adds an extra dimension in the way it refracts the performers’ reflections, so the dominant character is simultaneously seen in miniature, and vice versa. However, while the mother-daughter relationship is well portrayed, with solid performances from Rebecca Lacey (Patricia) and Lizzy Watts (Sofia), the whole seems hampered by the on-the-nose dialogue about financial inequality, and the stagey way the argument is handed back and forth. Spain may well be the stated setting, but it seems perfunctory at best (perhaps because the play started life as a short piece in response to the Royal Court’s PIIGS season, in which playwrights were tasked with tackling austerity in the five EU countries hardest hit); while Patricia occasionally channels ‘old Spanish mama’ by sitting forwards in a knee-grabbing stance, Sofia could be from anywhere. And maybe that’s the point – we’re all global capitalists now – but at times it seems almost as if the two actors are in different plays. But most troublesome is the twist (no spoilers, don’t worry), which, when it arrives, drops heavily into the narrative like a boulder from outer space, making no logical sense and adding neither nuance nor revelation to anything that’s occurred up to that point. And it’s at this here that Woods’ text, which had been by turns engaging and entertaining, albeit somewhat repetitive in places, loses the plot completely. This piece needs further development before it’s ready to fly.